3D Printing Technology Helps Improve Quality of Life for Animals. 3D printing is a truly amazing technology. In the past 2-3 years alone we have seen the technology make its way into all areas of study, going on to impact the lives of millions of people in one way or another, and has saved numerous lives across the world through state-of-the-art 3D scanning, software and printing technology- allowing surgeons to understand and carry out procedures that have never been performed before. Through these innovations many lives have benefitted from 3D printing technology, but it’s not just humans that have been reaping the benefits. Be it pets, wildlife or sea creatures a number of our furry friends have also experienced the many advantages that 3D printing provides, read on to discover SYS Systems Top 5 3D Printed Animal Prosthetics and how three dimensional printing has not only improved animal lives but also saved them. When Brazilian black-beaked toucan Tieta was found to have the upper part of her long, characteristic beak missing during her rescue from a wildlife fair in Rio de Janeiro, where many rare and tropical species are trafficked illegally, she could not feed herself nor attract a mate without it. 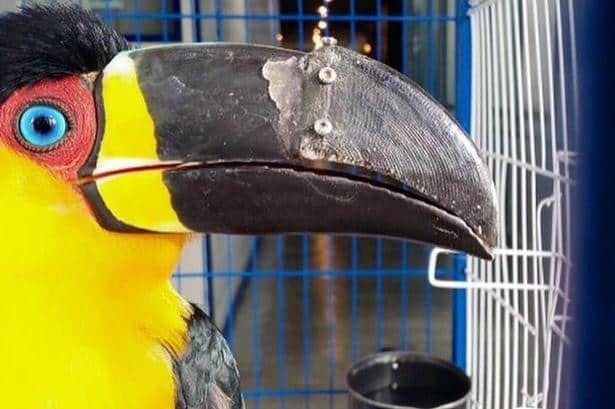 Then wildlife management group Instituto Vida Livre decided to, alongside three Brazilian universities, coordinate a project to fit Tieta with a 3D printed beak. Designing the prosthetic to be light and resilient took a total of three months- the 4cm, 4 gram beak replacement, prior to fitting, had to be covered in nail polish followed by a special polymer sealant. The printing process took two hours, fitting was an additional 40 minutes but realising she had it took three days. Now able to feed herself, Tieta still lives in captivity but now has a chance at living with a better quality of life, not to mention the ability to attract a mate. Born with two deformed front legs, Derby found it difficult to move around let alone run and was resigned to a life at the non-profit organisation Peace and Paws Dog Rescue, after his owners could no long care for him. Providing Derby with a home and preventing him from being euthanized, Peace and Paws Rescue offers both adoption of their dogs and foster care. So when Derby was fostered by a 3D printing enthusiast, Miss Anderson- she sought to help him with a solution that would increase his mobility. Feeling that a cart didn’t give Derby enough freedom not only in movement but also when interacting with other dogs, she decided to look into prosthetics. 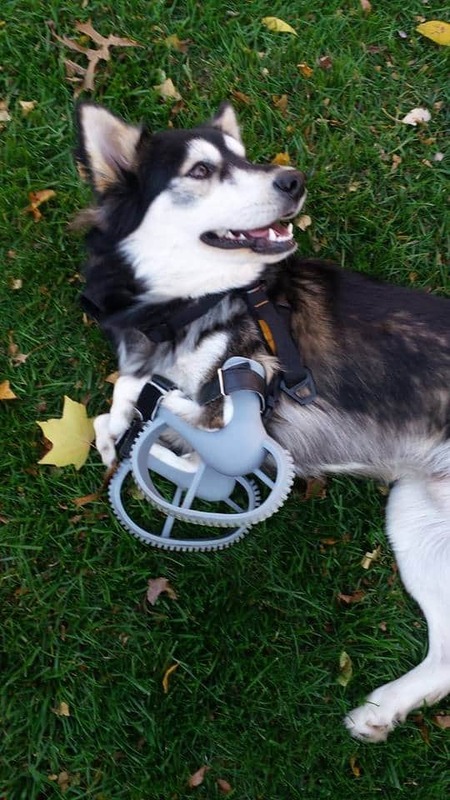 Now the husky mix runs and bounds around on his two 3D printed prosthetic legs. Designed and fitted with custom-made, rounded three-dimensional legs, after several iterations the team determined that a looped design would eliminate sinking and becoming stuck on softer ground like many pointed iterations usually would. The very first time the curved prosthetic legs were fitted to Derby, he immediately took off running as if they were completely natural for him. After being born with a left foot that was turned backwards, Buttercups carers made the decision to amputate it in order to increase her quality of life. The deformity meant that she was unable to walk or waddle like normal ducks and so with amputation other solutions became available. Her carer and founder of the Feathered Angels Waterfowl Sanctuary in Tennessee, Mike Garey, initially decided to fit Buttercup with a peg leg but soon realised that it was not suitable and sought another solution that would enable Buttercup to walk again. Using a 3D scan of the left foot of Buttercups sister, Minnie, Garey and a team of 3D specialists worked together to design a 3D printed mould which would then be used to create a silicone foot. Fitted onto Buttercups foot using a customised nylon sock, Buttercup was finally able to walk like a duck should. Several iterations have since been made to improve the foots flexibility, durability and fit. They were even able to produce a special foot with flapper doors that enables Buttercup to swim. 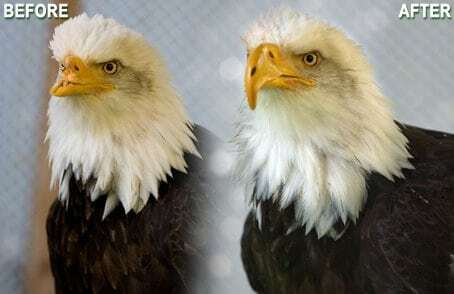 Shot in the face by poachers in Alaska during 2005, Beauty managed to escape with her life but lost a large part of the upper mandible of her beak. Unable to feed herself or preen her feathers on her own by the time she was found by Janie Veltkamp she was severely emaciated. Nursing her back to health at the Birds of Prey NW facility, her saviour saw that her beak was not growing back and a number of experts suggested the most humane option was euthanasia. At this point medical engineer Nate Calvin, offered his expertise in helping to reconstruct a new beak for Beauty- using 3D printing technology. Making a mould of her upper mandible he then 3D scanned it, tweaked the 3D model using specialist software and finally printed a new beak in nylon-polymer material. Then using a titanium metal mount which allowed for the prosthetic to be fitted to Beautys face, she began to eat and drink on her own again. Since then there has been many modifications of her beak over the years while her natural beak has shown signs of slight growth allowing Beauty to consume small strips of salmon by herself. In the ongoing housing crisis for hermit crabs theres a substantial shortage of shells in the ocean. Although technically not a prosthetic these crabs require a place to live in order to survive and protect themselves in the wild as part of a natural survival instinct. Because hermit crabs do not produce their own shells they instead adopt shells of other sea creatures. Without a shell to live in these crabs usually turn to cans, pipes, bottles or anything else they can fit in. Domesticated hermit crabs have to rely on their owners to provide a safe haven and so many owners too, seek out shells. Realising the impact a global shortage of shells could have on the crabs TeamUSA decided to attempt to design and develop 3D printed shells, calling it Project Shellter. While their prototypes are manufactured using plastics they are exploring avenues of implementing eco-friendly, sustainable shell solutions. The next step is to carry out empirical tests to see if the, surprisingly picky, hermit crabs take to the artificial shells. 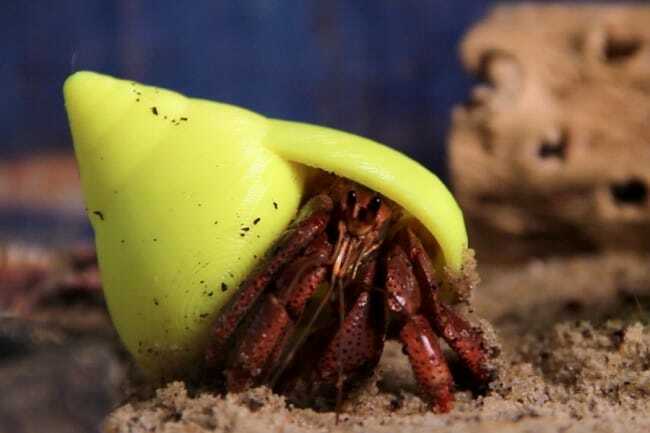 Project Shellter will carry out crabitat testing using their specialist team of uniquely-named hermit crabs: Shellton John, Paris Shellton, Tori Shelling as well as Kourtney and Khloe Karshellian. Let this serve as a heart-warming example of humans recreating a natural habitat without limitations using 3D printing technology. If you would like to learn more about how 3D printing is helping to change human and animal lives read our Top Three Medical Applications.